Central Vietnam, with its cities of Da Nang (sometimes spelled Danang) and Hue, offers visitors history, culture and food that are quite distinct from North or South Vietnam. Much of this area was hard hit by the Vietnam War, and rebuilding continues, with the government adding infrastructure to shorten travel times to and from major attractions. Its natural beauty, broad beaches, upscale resorts and friendly residents are making this a major destination for travelers from around the world. Located midway between Hanoi and Ho Chi Minh City (Saigon), the port city of Da Nang is Vietnam's third largest city and the largest city of Central Vietnam. Established in the second century, it was once the center of the India-influenced Champa Kingdom and is home to the world's largest collection of Cham art and artifacts. 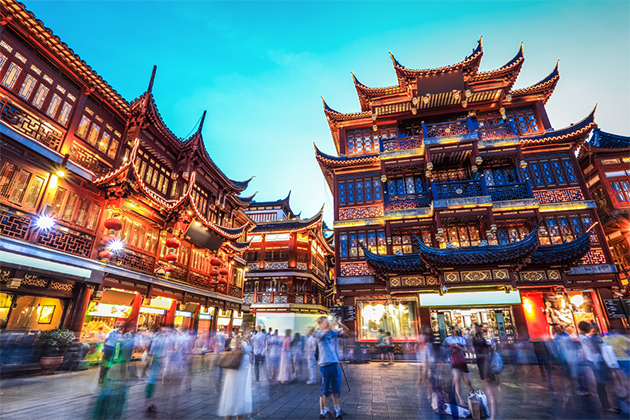 The city is best known for its role in the Vietnam War when it was the site of a major U.S. air base, and it is featured prominently in both the TV show "China Beach" and movie "Good Morning Vietnam." Since the end of the "American War," as residents call it, in 1975, Da Nang has prospered as a commercial center, its downtown bustling with markets and motorbike traffic. 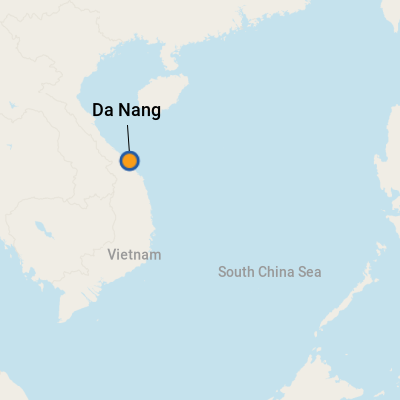 About 65 miles north of Da Nang is Hue. This UNESCO World Heritage Site bisected by the Perfume River was the capital of Vietnam from the 17th century until 1945. Much of its ancient Forbidden Purple City was heavily damaged during the Vietnam War's bitter Tet Offensive in 1968. Restoration is ongoing to enhance the city's growing appeal as a resort and tourist destination. One popular stop between the two cities is China Beach where American troupes enjoyed sand, surf and recreation during the war. Helicopter hangers and bunkers can still be seen nearby. South of Da Nang is the charming historic town of Hoi An. Some call this UNESCO World Heritage Site touristy, but that's because visitors love its mix of galleries, upscale shops and cafes. Both ports are industrial and used primarily for commercial ships. As such, they offer few port amenities other than souvenir stands set up next to the docks. Da Nang, Hue and Hoi An are comparatively safe, but like almost every crowded tourist area, there are pickpockets and scammers. There have been some incidents of men on motorbikes snatching purses from tourists in the crowded Central Market (a public market with lots of tables) in Hoi An. There also have been reports of pickpocketing by groups of young boys begging for money the markets in Hue. Remember to keep handbags, shopping bags and backpacks close at hand at all times. Keep currency and other valuable in cross-body bags that are difficult to grab or cut. While this isn't exclusive to Vietnam, ask first before you take a photo of a colorful local. The person might expect a small fee. It's best to set the price in advance than argue about its cost after the fact. Cruise ships from Tien Sa offer shuttle buses to Da Nang, typically dropping you off near the market. There are also a limited number of taxis at the pier (you have to walk about 0.3 miles to the taxi stand). Rates are usually negotiable but should be set before driving off. Don't count on finding public transportation at Chan May, although there may be a few unmetered cabs outside the port gate. 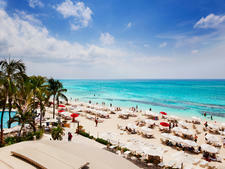 Rely instead on ship shore excursions for transport or make arrangements in advance with private tour or limo companies. Once in central Da Nang and Hue, taxis are readily available. Hoi An is compact and pedestrian friendly. The main unit of currency is the dong (VND), which comes in notes ranging from 200 to 5,000. For current currency-conversion figures, visit www.xe.com or www.oanda.com. U.S. dollars also are widely accepted. Carry plenty of ones and fives to buy bargain for souvenirs (if you use larger bills, your change may be in dongs). There are ATMs at branches of Vietcombank in Da Nang, Hue, and Hoi An. The official language is Vietnamese, but English and French are widely spoken. The Vietnamese love seafood, but chicken, beef, pork, vegetables and fruit are common in their dishes. Their cuisine is considered very healthy and non-fattening, which might explain why most of the people are thin, despite the fact that they seem to eat all day long. Dishes are often flavored by fish sauce made of fermented anchovies and spiced with lemongrass, ginger, Vietnamese mint, coriander, Saigon cinnamon, bird's-eye chili, lime and fresh basil leaves. The result is an enticing combination of contrasts -- sweet, salty and spicy. Pho is the Vietnamese noodle soup that is a particular favorite for breakfast, while bahn mi, a stuffed local bread resembling a baguette sandwich, is a treat any time of the day. Upscale dining is often a fusion of French and Vietnamese cuisine, a favorite of foodies around the planet. To dine like a native, take rice from the large shared dish and put it in your rice bowl. Use chop sticks to pick meat and seafood from serving dishes and add to the rice. Remember, it is very bad form to stick chop sticks into the rice bowl vertically -- it is the Buddhist sign of death. Packaged beans and ground Vietnamese coffee with its velvety chocolate flavors is a welcome treat, served hot or cold and sweetened with condensed milk. Trung Nguyen is the country's most popular brand.